Landing at Hosea Kutako International Airport for the first time might seem to some a quite daunting experience, from above it is literally a tarmac runway with a few buildings. Modern services and facilities however are the norm and the terminals are filled with quaint little shops and auxiliary service centers such as car hire. A business and VIP lounge, duty free shops, refreshing area with showers and bathroom facilities as well as a smokers area are just some of the services provided. Its size is an advantage as there is only one arrival and departure terminal, so no running around trying to find your way amidst a myriad of terminals and hallways. Shops accept all major credit cards, take note however that Diner’s Club and American Express are not preferred. A foreign exchange booth is located at the arrival terminal for visitor convenience. 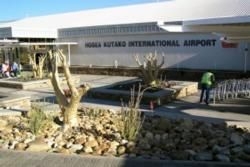 The airport is located 45km to the east of capital city Windhoek with a smaller airport located right in town for all domestic flights. Air Namibia is the official carrier and flights to and from neighboring countries are frequent, flights to and from Germany (Frankfurt) and London connects Namibia with the rest of the world. Taxi and shuttle services are readily available to and from the airport, however it is best to prebook this service with your travel agent or tour operator.